For some US cities, winter cycling is simply not an option—the bike lanes are covered in drifted snow, the plows are tearing up the road, black ice is lurking, your visibility is terrible, and cars are swerving everywhere. But if you live somewhere like the Pacific Northwest, winter usually just means rain—a lot of rain. If you want to keep up your commute through the rainy season, it’s probably a lot more accessible (and enjoyable) than you might imagine! 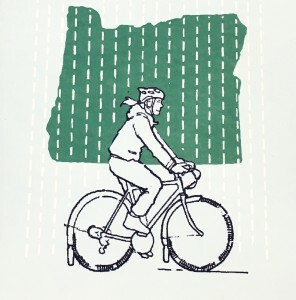 In fall and winter, many annual cycling events arise all over the Pacific Northwest to keep your stamina up to par! In fact, biking in the rain can be downright pleasant. The sound of rushing water, the quiet that falls across the city, and the fresh, wet smell of the air are their own reward—not to mention the feeling of pride you’ll have after a grisly ride. 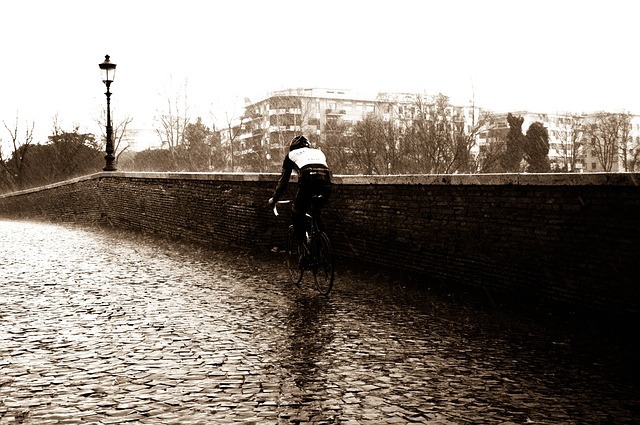 Riding in the rain is a rite of passage for cyclists. If you’ve ever slogged through a morning commute during a downpour, you’ve probably gotten at least one reaffirming head nod from a fellow biker passing by. 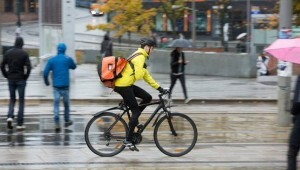 That tip of the hat (or rather, helmet) is an expression of solidarity—“I see you, you’ve got this, right on.” And though many cyclists might scoff at those “fair weather cyclists” who keep their bikes in the garage from November to March, anyone can be a year-round biker with the right gear. You don’t have to be in head-to-toe lycra to stay dry. In fact, wool is a great naturally-water-repellant material that’s easy to find secondhand if it’s not in your closet already. There’s a reason the navy gave its sailors heavy wool peacoats—wool can keep you warm and dry in a storm. If wool pants sound either too constricting or too difficult to find, try nylon rain pants. If you can’t afford to splurge on a pair specifically designed for cycling, you can often find perfectly adequate rain-proof pants or snow pants at an army surplus store or even your local thrift shop. With waterproof shoes—or even just plastic bags over normal shoes—you’ll be arriving at your destination clean and dry! And perhaps most importantly, stay visible! Rain and condensation decrease visibility enormously, on top of the fact that the daylight hours are already reduced during the winter months. You can get a reflective safety vest for less than $10 online, and throwing it over your coat before you leave might save you from serious injury. Bike with Full Fenders–and Waterproof Alchemy Goods Bag! Fenders are the best thing you can do to make riding in the rain more bearable for both you and your bike. Fenders are cheap (usually under $50 for a pair), easily found used, and easy to install. They’ll protect your pants from getting coated in the water your wheels kick up, and also from the muck, grime, and oil on the road that comes with that water. Your fenders also protect your bicycle from the road sludge—though the clean water falling from the sky might not present any danger to your bicycle, the sand, mud, and gasoline residue that will otherwise be sprayed all over your chain, detailers, and brakes will damage the machinery. We recommend full-length fenders, but if your bike wasn’t built to accommodate these (as many racing or dual-suspension bikes were not) you may have to settle for clip-on fenders. Most fenders are long enough to protect both your body and your bicycle from the water and sludge that you’ll stir up from the road, but they’re probably not quite long enough to stop you from spraying a stream of dirty water onto anyone riding behind you. If you regularly ride in popular bike lanes or commuter trails, install a DIY, up-cycled “buddy flap.” You can make a buddy flap from pretty much any material that’s sturdy enough to bend a little but not snap, like an old water bottle or plastic container. 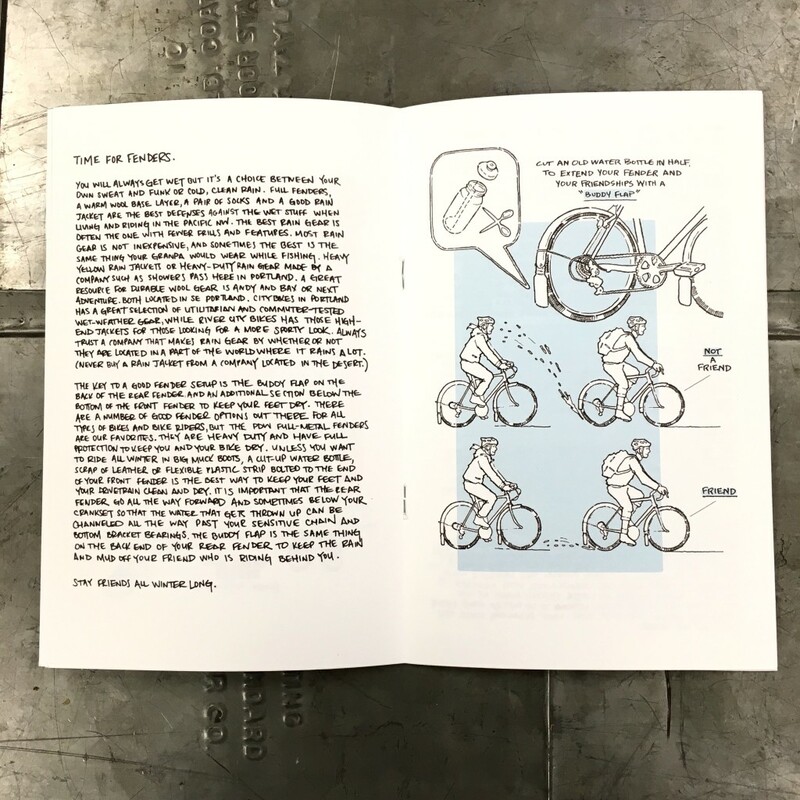 Check out these instructions for creating a buddy flap from Portland’s Riding in the Rain zine by Ira Ryan (Breadwinner Cycles) and Matt Hall. For more information, we recommend checking out the whole zine at TravelPortland.com. Keep dry this winter, Alchemists—I see you, you’ve got this, right on. Students everywhere are preparing for the coming school year. For a lot of us, that means a flurry of consumerism—about $17.6 billion dollars worth nationwide—and we hope that you’ll take a mindful approach to your school supplies shopping. There are lots of exciting upcycled or sustainable products that can help make your carbon footprint a little shallower, and most of them wind up looking better and lasting longer than their wasteful alternatives. 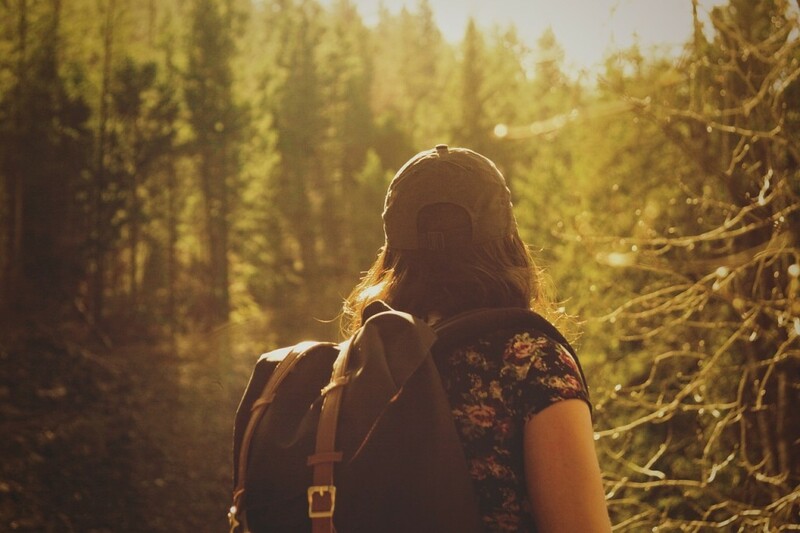 Here are a few of our favorite sustainably-motivated items for the 2015 school year. Not only are most plastic or vinyl binders un-recyclable and produced from synthetic factory-made materials, but they also release dioxins into the atmosphere during the manufacturing process. For anyone else who is sick of tacky, toxic, and short-lived plastic binders that are destined for the landfill, we recommend Naked Binders, which not only out-last other binders but are produced from 100 percent certified post-consumer waste board. They’re also completely recyclable, and thoughtfully designed for superior appearance and function. A water bottle is a student’s best friend. When you’re at school or on campus all day, you need to stay hydrated, and a reusable water bottle is the perfect way to quench your thirst and stay green. Disposable plastic water bottles are one of the worst environmental offenders—replace it with a Klean Kanteen! Klean Kanteen produced the first 100 percent BPA-free stainless steel water water bottle in 2004, and their commitment to toxin-free reusable stainless steel bottles has lead to a great line of products that last a lifetime. Even their packaging is sustainably designed! The trash-free lunch is a challenge every student should aspire to meet. The wrappers from pre-packaged foods or single-use items like plastic silverware have an astonishing impact on landfills. You can work toward a trash-free lunch by preparing your own food from whole ingredients, using reusable utensils, containers, and cloth napkins, and drinking from a water bottle. The first step toward a trash-free lunch is a reusable lunch bag—we love To-Go Ware’s Cotton Carrier bag made from cotton scraps collected in India. More sustainable than bags made from virgin materials, this upcycled lunch tote is also completely washable. Every student needs a #2 pencil, if not for note-taking, doodles, or free writes, then for those standardized tests or Scantron sheets. These #2 pencils from TreeSmart are a great upcycled alternative to wooden pencils. TreeSmart makes use of whole sheets of recycled newspaper for pencils that are as sturdy and easy to use or sharpen as wooden ones, but without the toll on our forests. 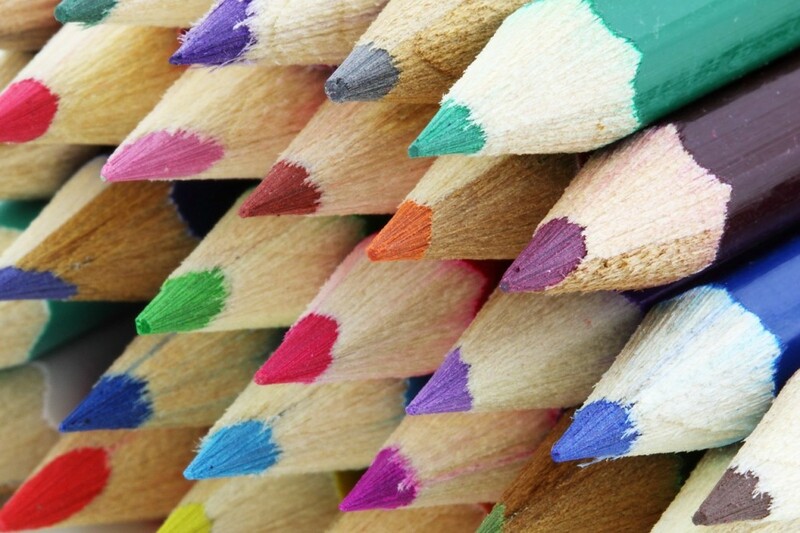 And for the artists out there, they also make colored pencils! We don’t want to be too self-serving, but our Brooklyn and Madison backpacks are two of our favorite products—they’re slick, tough, and unique, and can withstand just about anything. Students need a backpack that can protect their books, electronics, notes, cellphones, gym clothes, sandwiches, etc, but factory-produced materials aren’t necessarily the longest-lasting. 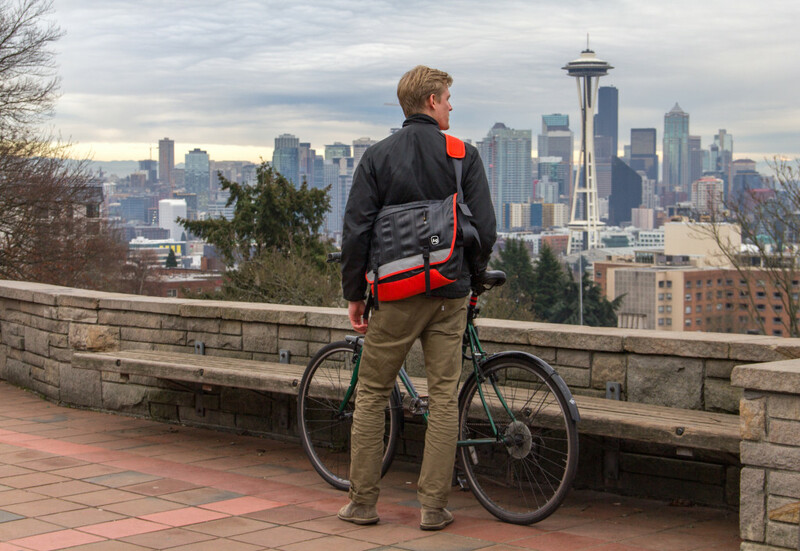 With an exterior of upcycled bike tire tubes, our Alchemy bags keep contents dry, safe, and secure while re-purposing waste materials. And the lifetime guarantee means that you’ll never have to throw away another bag over a broken zipper or a ripped strap. Good luck in class this year, Alchemists! We hope you’re able to check every box on your back-to-school list with a sustainable product you’ll love for years. Does Your College Bleed Green? How green is your campus? Does your dining hall serve local organic produce, does your student body take an active role in sustainability, do you have acres of surrounding woodland? Students take a lot of pride in their school’s athletic and academic achievements, or even in titles like “Hardest Partiers,” but what about their college or university’s environmental performance? Alchemy would like to give a shout out to five of the colleges and universities from around the country we think deserve some applause for their unique approaches to going green. After all, educating the next generation doesn’t count for much if they aren’t going to inherit a healthy planet. Colorado State is a rock-star among public universities and private schools alike, thanks in part to their devotion to a green curriculum. Of their 58 departments, 54 offer at least one course engaging with sustainability issues, and their robust School of Global Environmental Sustainability offers 19 different majors. Their faculty includes hard-hitting environmentalists like Temple Grandin, author and animal welfare revolutionary (who was played by Claire Danes in an eponymous HBO movie). They also have 11 LEED Gold buildings, 15 acres of solar panels, and their tree nursery produces 2 million seedling annually. This school was the second in the nation become climate-neutral, getting most of their energy from on-campus wind turbines, solar panels, and their partnership with Cow Power. Cow Power extracts methane gas from manure from Vermont’s dairy farms, converts it to electricity, and sells it to participants. The funds go to to local dairy farmers and the on-farm facilities. Unlike the sources of renewable energy most school turn to for their energy credits, Green Mountain is powered by a local source students can visit and learn about. Further, 46 percent of their graduates pursue careers in green jobs! Number one on the Princeton Review’s annual list of the greenest colleges, the green awareness of Lewis and Clark’s student body is outstanding. About 95 percent of the students at the College of Arts & Science voluntarily donate toward the purchase of Renewable Energy Certificates. 74 percent of their students take at least one class that includes sustainability learning, and 83 percent of students choose sustainable travel options like bikes. They also offer a unique certification program in Ecopsychology that teaches counseling psychologists to apply ecological research to their mental health practice. And their campus includes 95 acres of woodland to study and explore! UCSB is considered the greenest public university in the country, and the third greenest college generally. They have led the pack in retrofits, spending $2-3 million annually on efficient HVAC systems, LED lighting, and new insulated windows. Mostly, though, we love their TGIF program. The Green Initiative Fund (TGIF) was the first school water-action plan developed in the drought-vulnerable state of California. 90 percent of their landscaping is irrigated with recycled water, saving about 19 million gallons every year, and the seven-person committee has five student seats. This tiny, experimental college only has a few hundred students, and all of them are studying the same niche major: human ecology. Under the umbrella of “human ecology,” students are mostly able to define their own curriculum, planned around their interests and human relationships with the planet. They were the first college to go carbon neutral in 2007. The COA also owns 300 acres of farmland and forrest, and the vegetables, and the organic produce farmed by students comprises about 30 percent of the dining hall meals—and the compost from the dining halls is used on the farm! Alchemy would also like to give a special shout-out to Pinchot University on Washington’s Bainbridge Island, which we personally know is doing some amazing work—Eli Reich, Alchemy Goods founder, took classes there. Pinchot offers MBAs in Sustainable Business (the first program of its kind in the country! ), MBAs in Sustainable Systems, and Certificates in Sustainable Energy. For Seattle locals interested in a green continued education, Alchemy glowingly recommends Pinchot. To these schools, their students, and all the other people working to combine sustainable practices and education: right on. Thank you. You get it. Green campuses have an impact that goes far beyond their energy or water savings of their campuses—they’re getting an entire generation of graduates interested, engaged, and concerned, and planting some big dreams for how the world could look someday. What Makes a City Bikeshare Program Work? Could Seattle’s?